St Christoph is undoubtedly the hidden gem of the vast, varied and ever-popular Arlberg ski area. Centrally located between the linked resorts of St Anton, St Christoph, Stuben, Zurs, Lech and Warth, St Christoph provides the ideal base from which to explore the entire Arlberg ski domain. We’re all familiar with ski-in-ski-out hotels and chalets, well St Christoph is a ski-in-ski-out resort. Nestled in an open powder bowl at 1800 metres and benefiting from the Arlberg’s famous microclimate and exceptional snow record, St Christoph is the perfect destination for early and late season snow-sure skiing. 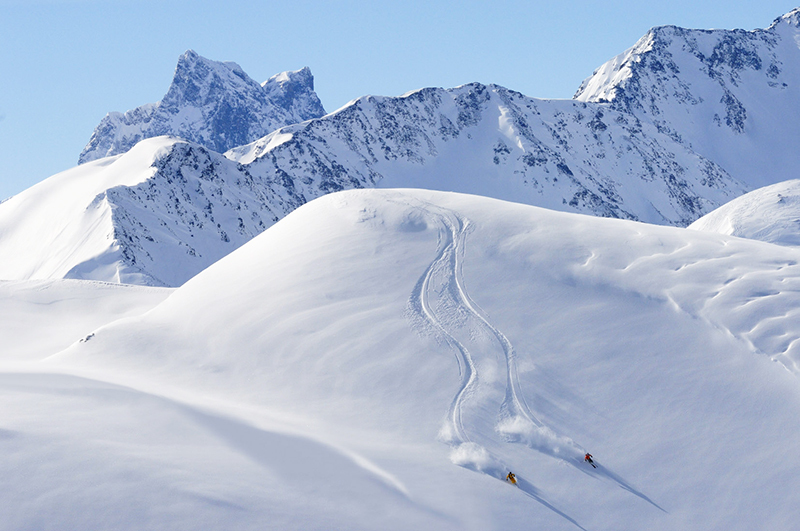 St Christoph offers a variety of skiing opportunities for every level. Beginners and novices are well catered for with two T-bar lifts and gentle nursery slopes that roll down in front of the hotel Maiensee, so when you’re done skiing for the day you can sit and enjoy a drink on the deck and watch your crew whizzing back and forth. Intermediate and expert skiers jump straight on the convenient and quiet quad Maiensee chairlift that whisks you straight up into the heart of some of the Arlberg’s best skiing. From here you can easily access the entire Arlberg ski area. The lift system in the Arlberg is state of the art, with huge and efficient lifts such as the Galzigbahn and Flexenbahn enabling you to rack up many kilometres of skiing in a single day. Opened in 2017, the Trittkopfbahn now links Lech and Zurs directly to the rest of the Arlberg ski area, so there is no longer any need to head down the mountain and catch a ski bus. With a total of 305 kilometres of pisted runs, it is certainly a challenge to cover all of the skiing that the Arlberg has to offer. However, with your Powder Byrne ski guide on hand to navigate the quickest lifts and show you the best slopes, you’ll be guaranteed to master the Arlberg while still leaving time for a celebratory drink at the legendary après ski bars ‘Krazy Kanguruh’ and ‘Mooserwirt’. To discover skiing in St Christoph and the Arlberg for yourself, call 020 8246 5300 or click here. Whether it's a corporate trip or for leisure, we've got some exceptional options for unforgettable events in the Alps. Davos is currently in the spotlight with the World Economic Forum currently taking place here, so we thought we’d take a look at all the incredible facets of this rare gem. The perfect Alpine retreat but set in a valley packed with buzzing activity, exceptional gastronomy and endless skiing, St Christoph has it all.